Product placement plays an integral part in how movies are financed these days. Artful product placement in a film showcases the sponsored wares in a way that is obvious but unobtrusive. The product placement in Mere Dad Ki Maruti (“My Dad’s Maruti“) is gratuitous, as though the movie is really one long commercial for an automobile. 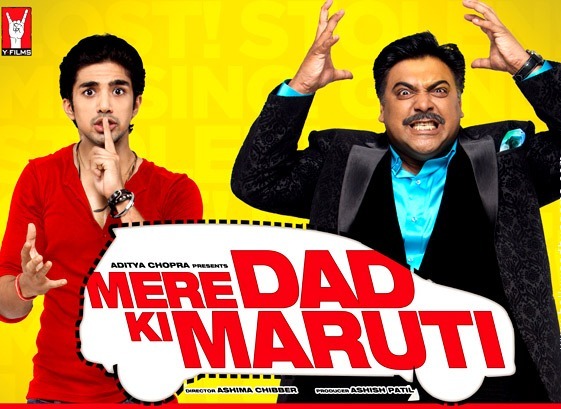 The overt commercialism is a shame, because Mere Dad Ki Maruti (MDKM, henceforth) is a pretty good movie. Created by Y-Films to appeal to a young adult audience, writer-director Ashima Chibber’s plot draws inspiration from a number of ’80s comedies, particularly Ferris Bueller’s Day Off. The story is familiar but fresh, and it doesn’t overstay its welcome. The story centers on Sameer (Saqib Saleem), an immature college student caught up in preparations for his older sister’s wedding. As the movie begins, a brand new Maruti — an Indian subsidiary of Suzuki — has arrived in the family’s driveway. Sameer assumes the car is meant for him, until his short-tempered father, Tej (Ram Kapoor), explains that it is a gift for Sameer’s soon-to-be brother-in-law, Raj (Karan Mehra). Tej says that if Sameer wants a car, he needs to earn it by being responsible, like Raj. Quickly forgetting his father’s rebuke, Sameer “borrows” the car to impress a girl, Jazzleen (Rhea Chakraborty). Their first date is a success, until Sameer hands the car keys to a man he mistakes for a valet. The car goes missing, and Sameer resorts to increasingly ridiculous means to replace it, aided by his level-headed best friend, Gattu (Prabal Panjabi). Both the structure and themes of MDKM are familiar. There’s an emphasis on personal responsibility, familial love, and the bonds of friendship. Sameer and Gattu make a great comic team, and Jazzleen is a welcome addition when she’s finally let in on the secret. In fact, the movie has a lot of really funny moments. The highlight is a dance performance Sameer’s sister, Tanvi (Benazir Shaikh), dedicates to Raj, in order to convey her unspoken feelings for him. However, her feelings border on X-rated, making for an awkward performance in front of the whole family. For all that MDKM has going for it, it’s impossible to overlook the its crass commercialism. I’m not sure how much Maruti paid Y-Films for titular product placement rights, but it had to be a lot. There are songs and speeches dedicated to Maruti, even a musical montage in which Sameer and his family fold down the sedan’s back seats to make room for all the luggage they need for an overnight trip. The most reprehensible scene takes place in a Maruti showroom, where Sameer and Gattu inquire about buying a replacement for the car they lost. The model they want is over their meager student budgets, but the salesman explains what great value you get for the money: comfortable seating for seven, plenty of trunk space, and two engine options. If you come in for a test drive, you might even win a car. Wow! This sales pitch would be tacky in any movie, but the fact that this film is aimed at young people makes it reprehensible. Y-Films should be embarrassed to stoop this low. What’s next, an animated movie for preschoolers, starring Kool-Aid Man? This entry was posted in Reviews and tagged 2013, Ashima Chibber, Benazir Shaikh, Bollywood, Ferris Bueller's Day Off, Hindi, Indian, Karan Mehra, MDKM, Mere Dad Ki Maruti, Movie Review, Prabal Panjabi, Ram Kapoor, Rhea Chakraborty, Saqib Saleem, Y-Films on August 9, 2013 by Kathy. Indeed, there are times when one wishes that Y-films were more choosy about picking up movies. All the productions by Y-Films have had solid plot structures, but there always something that seems to go horribly wrong. MDKM is the most promising Y-Film yet, so I remain cautiously optimistic. I was expecting a review of “Chennai Express”. I walked out of the multiplex because it was becoming too painful to watch. Shah Rukh Khan is mostly to blame – a little less acting would have made the movie watchable. I wonder what you think of the movie.